Chalkboards are a necessity in most schools, but they can also be used to display the menu in your restaurant, cafe, or banquet hall. You can find these products in a variety of sizes, depending on how much text you need to display. We even carry small chalkboards and large chalkboards with different color frames, so you can match your board to the decor in your establishment. If you’re looking to display information in a creative and visually appealing way, try writing it on a chalkboard. With chalkboards, you can show off your daily drink specials, tell customers how long they might have to wait for seating, or deliver important messages to your staff in your back-of-house area. For related products, check out our chalk and makers, presentation write-on boards, and markers and highlighters. 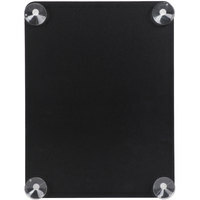 If you're wondering where to buy american metalcraft chalkboards, we have a large selection of american metalcraft chalkboards for sale at the lowest prices.